The only new thing since last post is the "outrunner outrigger." 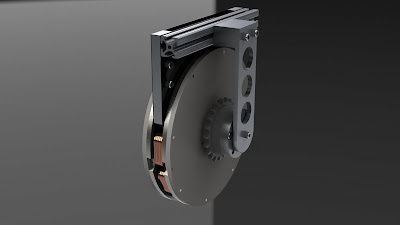 It connects the mounting structure to one side of the motor shaft, which is not rotating. This completes a structural loop, giving the shaft more stiffness than if it were just connected to the central stator structure. The extra weight it adds is offset by the ability to take significantly more abuse from the chain load on that side of the rotor. This is a minor design change, though. What about the windings? There's the first six, done in about three hours. Compared to the ones in the scooter motors, these windings are a breeze to make, for a number of reasons. First, the flat magnet wire is absolutely wonderful. It packs nicely and stays where you put it. But, it only really works because I can remove individual winding inserts and wind in free space. This means instead of looping wire through slots, I simply spin the entire insert, spooling wire onto it under tension. It's not trivial, but it's not very hard either. I would place that in the "win" category for this motor. All the windings, a two-day job. Kit Bot FTW. I'll replace the outrigger later. SWEET!!! Can't wait to see it on your controller. Speaking of controllers, I have need of a BLDC controller to control a sensorless motor that is going to spin the input to my speedometer (since I no longer have the transmission, the speedo cable has nothing to connect to). I was thinking of using an RC BLDC motor to turn the input to the speedo but I need very good control of motor RPM over a range of 0-2000 RPM. Did you make any progress on the RC car motor? Would your 3ph DUO be a good candidate for this application? Second question: Is there any reason you couldn't make the winding cores out of a standard magnetic laminate? I know this design is coreless, but those black triangles seem so much easier to manufacture instead of the "H" core in the Epic. Cooling solution, maybe? 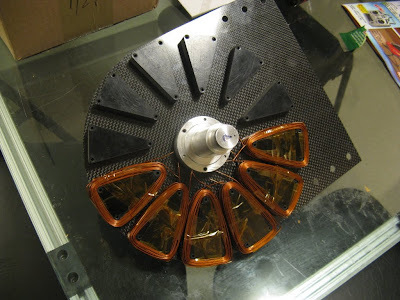 Make the winding cores out of some sort of liquid carrier? Thanks! Aiming for 10kW at 3,000RPM, but not there yet I don't think. I would also like to make a lighter version. I think I can get it down to 18lbs (currently 24lbs). @Electric_02: I am thinking about liquid cooling solutions running lines in the gaps between windings. Another interesting suggestion somebody had was to just run deionized water or even oil straight through the stator. Sounds messy to me. The problem with making these cores laminated is that the "easy" direction to slice it (axial) doesn't help. It would need to be stacked either radially or tangentially, both ways have varying cross sections. Sintered iron cores could work, though. The speedo sound like a job for a servomotor controller. (Go this speed no matter what.) My RC system is torque-controlled, not speed controlled, although it could probably be reprogrammed to do speed control. With a typical RC controller, you get voltage control. It's roughly proportional to speed, but not exact. I get what you are saying about the voltage controlled, not speed controlled controllers. I guess without some sort of speed feedback, the controller doesn't really have any idea of the speed of the motor because it doesn't know what the load is. I was hoping that by controlling the waveform generated to drive the motor, you would know what the speed of the motor was and then a feedback loop could be programmed to maintain a desired speed. As far as the direct oil cooling... I've heard of such things before. You're right, sounds MESSY, especially if you ever had to take one apart. Friggin awesome so far... I can't wait to see it finished! Have you thought about the new Insulated Iron Powder for a core. Better than sintered iron since it is pressed tight with epoxy and each iron particle is insulated from the next. You could wrap it axially with a thin piece of kevlar or fiberglass to ensure it keeps its shape even if it was to get damaged..... just a thought.. That is what I am trying to get a hold of. I tried using laminations like from Protolam but they wanted like $5K for just one simple motors worth... Way to fracken expensive. Good FKN mechanical Design but you are far away from good BLDC motor you FKN idiot, you must have some E. engineer helping you idiot!!!!!! Could it be a problem using Carbon fiber because it is conductive and may cause Eddie current? Thinking of your 15 amp no load. I did the math on that (using measured CF conductivity) and don't think it would account for that much load. I still think it is due to tangential field cutting through the wide dimension of the flat wire. Iron core motors wouldn't have this issue since the field is contained in the stator steel. 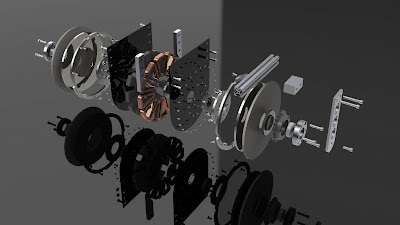 I didn't think about the consequences of flat wire in a coreless motor, though. did you ever end up figuring out a cooling solution and what was causing the 15A no load draw, if it was the wires did you consider using litz wire? 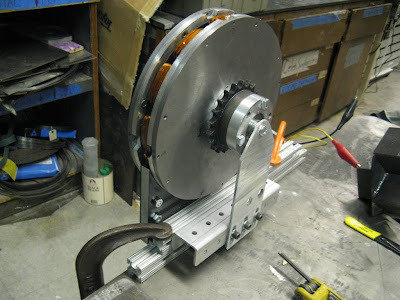 Also have you considered placing the magnets in a hallbach array for increased torque density? Lastly, could you either share you script or explain in a bit more detail the process for the back EMF prediction, thanks. 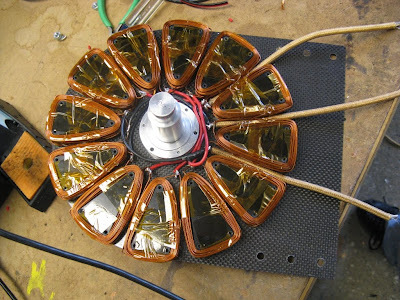 Awesome project, looking to build my own coreless hallbach array motor. Hi AC! I'm fairly certain the extra dissipation was due to Eddy currents in the long dimension of the flat wire. It was a design error on my part: I thought using flat wire would be enough since the majority of the field is axial, but there's enough tangential field jumping from pole to pole, cutting directly though the wide side of the copper, to cause issues. Litz wire would have been the way to go, for sure. I built the motor around these off-the-shelf magnets. Would have loved to do a Hallbach array instead to save some weight from not needing back iron. The first post linked below has more detail on four different methods I used to get an idea of the back EMF. They were all pretty close to each other and to the actual build! I think my favorite was the geometric one, just because it's a silly way of doing the math.